Right off the bat, it’s worth pointing out that Grave Lines’ Fed Into The Nihilist Engine will not be for everyone. Granted, that’s fairly easy to deduce on its own; at over an hour long with the opening track contributing almost a quarter of that, this is hardly the new one from the latest pop-punk flavour of the week. If that wasn’t enough, a lyrical direction focused on spreading negativity that’s clouding the human mind is more than enough to alienate anyone unfamiliar with such dense, heavy concepts. For anyone with an open mind though, Fed Into The Nihilist Engine is the sort of oppressive, crushing sludge-metal that’s so engrossing and captivating, even for a band that’s clearly still in the early stages of their career. Yes, the Neurosis influence is blatant, and the longest cuts can occasionally waver through a lack of true, unique personality, but considering the quality of what’s on offer, that’s a worthwhile trade-off to make, especially now. There’s a burning, pitch-black creep to tracks like Self Mutilation By Fire And Stone that spare no expense in sounding as hulking and imposing as possible, while a track like Shame / Retreat takes a completely different bent in its haunted, atmospheric folk presentation, albeit one that’s no lighter or less evil. There’s something so earthen and destructive about the instrumentation too; this is a very slow, almost methodical album, but the presence of its seismic guitar rumbles and looser drum fills still storms through on Silent Salt and The Greae. It’s the sort of huge, pummeling colossus of an album that has enough sheer presence and volume to offset a lack of uniqueness, both in the power of the instrumentation and in Jake Harding’s guttural, ironclad roars. Even for those who aren’t traditionally doom- or sludge-metal fans, Grave Lines still offer enough in sheer expansive might to become involved in regardless. True, it’s not exactly the most groundbreaking release ever, but Fed Into The Nihilist Engine really doesn’t need to be; there’s professionalism in its construction, as well as true heaviness that always carries such enormous potential to build on and enjoy. It’s definitely worth taking the time to explore fully and embracing the fascinating sounds that Grave Lines are bringing to the table. 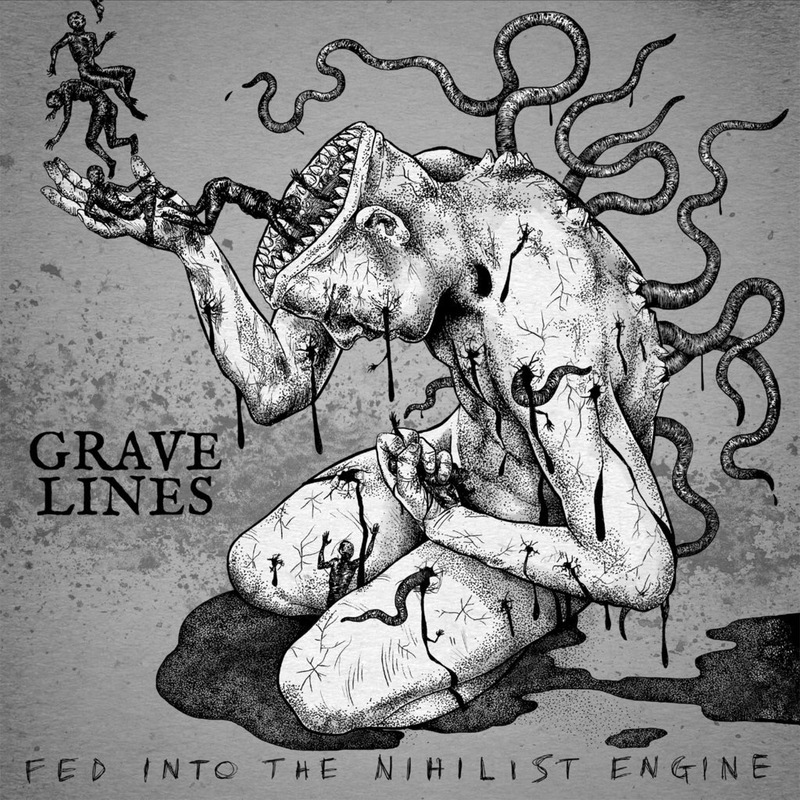 ‘Fed Into The Nihilist Engine’ by Grave Lines is out now on New Heavy Sounds.